Wicklow’s Past is an ongoing series by Stan J. O’ Reilly of Wicklow’s Historical Society. As part of the Wicklow Regatta Festival, brothers Stan and Vincent O’Reilly of Wicklow’s Historial Society will give 40 minute talks this Sunday August 5th in Wicklow Sailing Club at 6:30pm. The ancient name for southern Wicklow can be found in the Irish Annals as ‘FORTUATHA LAIGHEAN’ which in origin means ‘The Stranger Tribes of Leinster.’ These people arrived in the country from distant shores. Like the Vikings who came after them they had found a safe refuge and a home from home with a temperate weather system which they favoured, which prompted them to stay and settle down. Before this could happen, they had to establish relationships with the ruling locals, form political alliances and intermarry. The Vikings who arrived later in Wicklow, favoured this approach as otherwise they would be attempting to establish a settlement in the midst of a hostile environment and were outnumbered — being outnumbered was one of the main reasons why Vikings were never victorious in battle in Ireland. These foreign tribes were absorbed into ancient Celtic identity and way of life in southern Wicklow. With the coming of Christianity it has been recorded — truthfully or otherwise — that St. Palladius landed in the area of present day Arklow in the year 431. He is credited with the founding a church somewhere in the locality, possibly the heights at Arklow Rock. St. Patrick who arrived in 432 is credited with the founding of a church below Bray Head. Land at Kilranelagh was a much revered site of the pre-Christian community which had existed there. Sacred rites, rituals and druidic practices were carried out to the north slope of Kilrenelagh Hill, long before the construction of the Christian church. These ancient druids wore many hats and performed many tasks which were of benefit to their communities. The druids acted as historians who kept the memories of the ancestors alive; doctors who tended to the ailing and sick; scientists, and astronomers who defined the portents from their surroundings and the night sky. They were also the teachers of their day and instructed their novices in the arts of druidic practice. They acted as the judges, jurors and executioners within their communities, deciding on the need for animal sacrifice — or in times of great crisis, human sacrifice. Their decisions involved rituals and rites which were to be strictly observed. They also read the omens of the sky and deeply studied the weather and their natural surroundings and kept a close watch on the daily lives of the rulers and their followers. Such rites, rituals and practices could not in any way be described as a religion, but more as the observation of sacred rules and regulations which governed their lives. St. Kevin, a famed early hermit monk and later more famously associated with the monastic city of Glendalough, lived a life of hermit isolation, seclusion and prayer in the wilderness, as did so many others who would go on to fame and sainthood, locals and runners in alike. St. Kevin studied at Kilnamanagh in Tallaght, though there is a counter claim that this was Kilnamanagh in Glenealy, which was a Christian holy site with an early timber church erected there. Kevin found a retreat at what was known as the King’s River Valley — it was here that he prayed to God. At the valley, his way was blocked by deep forestation and bush. Intent on travel, Kevin prayed deeply that a passage would be made available to him in order to traverse the thick woods that surrounded what is now modern day Hollywood. He wished to build a church beyond where the forestation, where God had ordained that Kevin should. This is how Hollywood, in tradition, came to be named in origin, the Holy Wood. His prayers were answered and an angel appeared, who bent the surrounding trees to clear a path for the holy man. In return, Saint Kevin promised hell and a short life to anyone who burned green or dry wood from the area. Kevin went over the pass into Glendalough, in an area which then became a famous pilgrim path to the later monastic city. 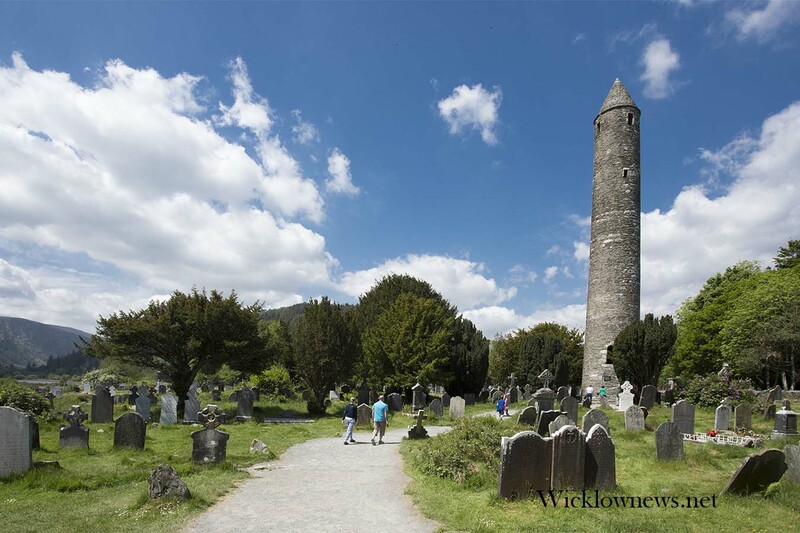 It is also said that another pilgrim path to Glendalough may have existed from Innisbaoithin on the east coast —famous for the local St. Baoithin. A pilgrim marker stone from the Hollywood to Glendalough pilgrim path can be viewed at the National Museum of Ireland.